Here you can find all the links from my book Web Design in Easy Steps, broken down by chapter. As well as links to website design tools and website management tools, I've included links to the good website design examples used in the book. You might want to look at these in your browser, so you can see how these sites work more easily. The book's commentary explains why each site is here and which aspects of it make it particularly interesting to web designers. I've also added some extra links to other resources and articles on this site, which I think you might find useful. I've highlighted these by writing "Extra" at the start of their line, so you can skip straight to them if you want to. I've tried to avoid too much repetition (Amazon is mentioned in a few chapters, for example, but I've not listed it against each chapter here). I've basically tried to make this webmasters' links list a useful companion to the book, and left out anything that I didn't think you'd find useful. If any of these links break or you identify other issues (such as a massive site redesign, which makes the examples inconsistent with the book), please contact me. 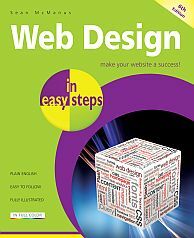 You can find out more about Web Design in Easy Steps here, and can order your copy at any good book store. You can download the website design demonstration files from the book here.